Steam mops can help you scrub even the toughest grime and stains from your tile floors. A good steam mop can blast grime off of floor tiles, and reach into tile grout to clean and sanitize. However, not just any mop will do! Lots of mops will leave streaks, smudges, or even puddles of gritty sludge on your floor. Even worse, some of them simply don’t work. They’ll leave your floors looking just as dirty as when you started. You want the best steam mops for tile floors. But where do you start looking? There are dozens of options available online, and all of them look great from the packaging. That’s where we come in! We’ve done extensive research to help you find the best mops for your tile floors–so you don’t have to spend so much time searching. We looked for a few key factors: affordability, effectiveness, ease of use, and strong buyer ratings. We wanted to find mops that cleaned quickly and effectively, and would continue to do so for years to come! Read on to find our full reviews, along with a helpful buying guide. 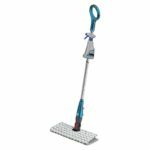 Shark’s new Genius Pocket mop is our current recommendation for cleaning tile floors on a budget. It’s quickly becoming one of our favorites to use on any flooring type! This one’s a great choice for people who have mixed flooring, or just tile. The mop “pockets” are dual-sided, just like the pricier Shark’s. You can flip them to get more mileage out of each! We’re actually really impressed with these new cleaning pads, even compared to our more expensive picks. They have lots of strands to reach into grout! More importantly, the fabric is interwoven with grippy strips that do wonders removing stuck-on gunk. They’re effective without being abrasive, which is a hard balance to strike. We’ve found that these pads cut down on the amount of scrubbing you have to do. One back and forth pass is usually all that’s needed. The other benefit of the strips is that they work like a squeegee to keep water moving with the mop head. You don’t end up with any pools left behind. One of the most impressive things we’ve noticed about this one is it distributes steam all across the cleaning width of the mop head. That’s not the case with most mops at this price! You have a lot of control, for something relatively inexpensive. There are 3 different steam settings to choose from. Most others at this price don’t have multiple settings. We absolutely love the new spray nozzle on the front of this thing. Older Shark models (and some mops from other brands) had “spray” settings, but that just meant that the whole head would crank out more steam. You’d be swimming in water before you knew it! This one lets you target a smaller area, so you can add some intensity without making a big puddle. It’s easy to use, too. You don’t have to pull a trigger: you just flip the mop head and press to spray. If you’re the sort of person who hates touching grimy mop cloths, you’ll love this thing. You can put the pads on and take them off without touching them! The mop head basically folds itself into the pads, and then releases them like a claw. We found that it’s not always foolproof: sometimes it’s easier to use your hands when you’re putting a pad on. Still, being able to drop them into the washing machine or a pile of dirty laundry without touching the filth is awesome! This is covered by a very long warranty (5 years!). That’s a lot longer than the average steam mop policy! The Genius has a great spray nozzle for targeting tough spots, but it doesn’t have the scrubber brush you get on the Bissell. If you have particular deep grout, you may want to spring for the Bissell. It’s not as much of a package as the Shark Blast and Spray. You get a whole extra mop head in that one. There are a few design inconveniences which mark this out as a budget steam mop. The controls are all down on the shaft, instead of on the handle. You can’t remove the water tank, either. Since you’re supposed to store these things empty, that makes things a bit awkward. It doesn’t stand up well on its own. The whole thing is a bit lightly-made compared to our other recommendations. While this has a relatively good reliability record, it’s still iffy over the long term. That’s true of nearly all steam mops, sadly. Our midrange pick is an updated model from Bissell. It’s a nice midpoint between the Shark’s, especially in terms of affordability. 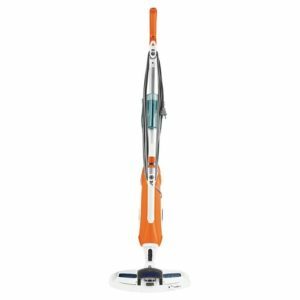 The Bissell specially designed for people with pets, but is a powerful cleaning tool for the rest of us, as well! We’ve found that it’s great for stains, and takes very little effort to use. This updated model of the PowerFresh Lift-Off has a few great new features and improvements. We love the elastic band around the cleaning pads, which eliminate tricky/breakable clips. 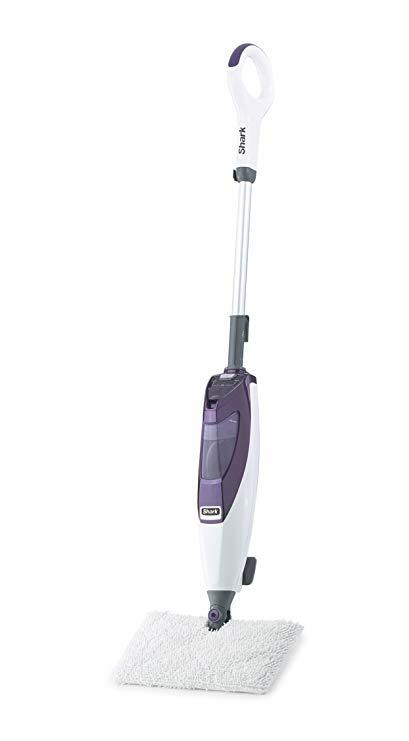 The faster steam production, larger reservoir, longer cord, and level selection are all thoughtful improvements which make this mop easier to use, and make cleaning less of a chore! It includes 13 attachments for cleaning appliances, countertops, windows, grout, and much more. They’re stored onboard, so you’ll have them nearby as you need them. The unit lifts off the shaft for handheld use on counters, sinks, and more. Our favorite feature is the flip-down Easy Scrubber for tackling tough spots. This rubber unit combines blades and brushes in one tool. It’s perfect for getting tough, caked-on grime off your tiles, and can also be a great tool for reaching into tile grout. To engage it, you simply press and lock the easy footswitch. Previous buyers raved about how effective the scrubber is. They said it could remove the toughest gunk, even dried paint spots and stains. It’s extremely easy to push and maneuver. The microfiber pads eliminate friction, and the unit produces enough base level steam to allow it to glide along your floors. It also has a swivel head, so you can clean around and under furniture. It’ll work on any sealed hard floor. Plus, you can use it to treat stains on carpets and rugs. There’s also an attachment for upholstery and fabric cleaning. The unit is certified to kill 99.9% of germs and bacteria, without using any chemicals which might be harmful to you and your pets. Best of all, it leaves very little residual moisture. And in its place, it’ll leave fresh air! The PowerFresh Pet model comes with scent discs, to freshen air and eliminate pet odors as you clean. The water tank is a bit awkward to fill. Because it’s not removable, you have to hold the whole unit over the sink. You can fill it from water bottles on the floor, but it’s easy to spill water and make a bit of a mess unless you do it over the sink. Some reviewers also said the cap is an awkward design. Users found that the grout brush has a tendency to warp under high heat. We’d recommend steaming the grout, and then using steam sporadically as you scrub, rather than blasting the brushes constantly. The steam is always on. While this isn’t much of a problem for floor use, it can be a bit of a pain when you use it in the handheld mode. You have to turn the unit completely off to change attachments. We think this mop ticks all the boxes for an ideal steam mop, still for a very reasonable price. 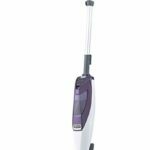 It’s got several different cleaning modes, automatic steam control, and a portable mode for cleaning above floor-level. If you’re after versatility without compromising on size or power, this is for you! It’s the most expensive of our recommendations, but it offers the most features and functions! Like the other Shark, this model uses pressurized steam. That lets it reach into grout to really deep clean your tile floors. You’ll kill germs even in low grout troughs, which are typically breeding grounds for wet bacteria. The updated version, which we’re recommending, has a few nice improvements over the old model. There’s a larger water tank, a longer power cord, and intelligent steam control. You can also choose between steam and spray modes. 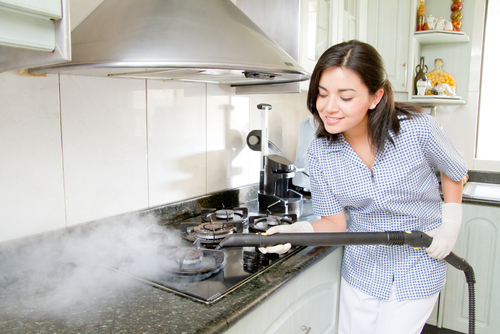 The steam option sanitizes an area without getting it very wet. The spray mode loosens floor dirt for quick spot cleaning. And you can combine the two for a mopping powerhouse! Intelligent steam control allows you to pick the setting that’s best for your floors, and for the task at hand. Plus, all the controls are on the handle. No need to stop and reset things mid-cleaning! A reserve of steam is always ready, thanks to a special holding tank. You won’t have to press the button and wait. The floor attachment is really superb. It has a double-sided pocket design, which allows you to use both sides of your mop pad. That gives you twice the mileage on a single pad! Plus, the attachment and pads are slightly oversized compared to the competition. At 12″, you can cover lots of ground with this thing. Oh, and surprise–there are actually two mop heads! That’s right–this one comes with both a triangular and a rectangular shaped head. You can choose whichever works best for the room you’re cleaning. It actually comes with a whole host of accessories. There are the two mop heads, washable pads for each, and a host of extra tools for cleaning into nooks and crannies. You can clean above floor-level, thanks to the extension wand and accessory scrubbing pads. Using them, you can convert the Shark into a convenient handheld tool. It fits easily in tight spots, and is ideal for countertop messes as well as floor situations. Even though it’s a new model, it runs a bit cheaper than most other high-quality steam mops. And with everything in the package, you’re getting quite a bargain! Shark customer service doesn’t have a great reputation. People who bought the last Steam and Spray had problems with durability, and Shark wasn’t very helpful. They’re stepping up their game recently, addressing online reviews and complaints personally. We don’t think you’ll have anything to worry about, but the company still has some work to do in that area. Our absolute favorite steam mop for tile floors is the Reliable Steamboy 300CU. It’s not as flashy or as popular as the Bissell and Shark options above, but we think it’s simply stellar. It’s powerful, user-friendly, and as reliable as the name would suggest. This is a cleaning tool you can use for absolutely all your flooring needs. It fits everywhere you need it to. While there’s certainly something to be said for having a larger cleaning head, the Reliable’s is nice because it fits into tight spots easily. The 11″ cleaning path gets a decent amount done at a time, though! We also love the triangle shape for getting into corners. As with our other picks, it has swivel steering. Where the Reliable stands out is in the ergonomics department. It simply feels better to use than the Shark’s or the Bissell. Everything’s well-balanced and fluid. The 2 washable microfiber pads you get in the box are all you want them to be. They capture a lot, and keep your tile finishes safe. This is the only steam mop we’ve reviewed which didn’t make us miss a canister system for grout, even a little bit! It includes an integrated, bristled scrubber for grout and tough spots which does a perfect job. It also comes with a carpet glider attachment, so you can freshen and work on removing stains. One of the best features is the replaceable water filter. That allows you to use tap water, instead of having to buy distilled water by the bottle! We haven’t actually seen another steam mop with one included. Our other picks (and the other options on the market) require you to either use distilled water or plan on your mop conking out due to scaling. It’s powerful and efficient. You get about 25 minutes of steam per tank, and the Reliable heats in just a couple seconds. It’s ludicrously fast, actually. We also noticed that the Reliable produces much hotter steam than our other picks. Not only does that clean and sanitize more effectively, but it leaves less moisture behind! This is a company that makes a lot of full-size canister steam units, and that expertise definitely shows on the Steamboy mop! It’s much sturdier than the others, even though it’s often available at a lower price. The Reliable is covered by a 1-year warranty, and we expect it to last much longer than anything from Shark or Bissell! We don’t have any complaints about this one! Ordinarily, we’d note that our top quality pick was more expensive than the others. Since that’s not actually the case here, no more need be said! The Shark Genius is our top recommendation to anyone on a budget. It’s the most affordable of the three, but it still packs a lot of smart design features. We think it does a great job on all hard flooring. It gives you more cleaning capacity than our other picks, since you can flip the pads. This isn’t as good as the Bissell for deep grout, though. And unlike the Bissell, you can’t use it for spot-cleaning on carpets. Likewise, the Shark Steam and Spray gives you a few more tools and a lot better maneuverability. 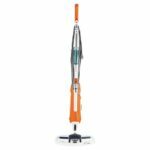 You’ll get your tiled flooring spotless with any of these models, but for overall value, versatility and performance, we would recommend the Shark Genius Steam Pocket for anyone looking to buy the best steam mop for tile floors. The new Bissell is the best choice for pets and messy households. We love how thoroughly it cleans–from stains, to smears, to eliminating odors. Parents will also love its tough stain-removing action and carpet compatibility. The special foot-scrubber is a surefire way to get any hardened gunk off your floors.It’s fantastic for grout, too. The Shark Blast and Spray is the most convenient of the three, as far as range is concerned! It’s priced neatly in the middle of our other recommendations. We love its portability with the cordless spray mode. You can address spot-cleaning issues on carpets, and be able to maneuver on stairs without having to think about a power cord. We recommend it if you will mainly be cleaning tile floors, and might occasionally need to spot-clean a carpet. Most steam mops cost between $100-$200. For wood floors, many budget models will do the trick. Wood floors are generally smooth, and don’t require too much blasting power. For tile floors, you want a more powerful mop that can handle uneven surfaces and tile grout. More expensive mops have better control, to make sure the mop doesn’t leak or leave your floors sopping wet. They’ll also have better scrubbing power. Look for multiple settings, and attachments for cleaning kitchen appliances, bathroom fixtures, and especially tile grout. If you’re cleaning floors with moderate to deep grout, you’ll want a more powerful mop with pressurized steam or a spray mode. While you won’t need to spend money on soaps and cleaners, some mops have disposable cleaning pads, which need to be replaced. Even washable pads will eventually wear out, so you’ll want to consider how much it’ll cost you to have a couple replacements on hand. Cleaners are a bit easier to get away with on tile and linoleum than wood floors. Some steam mops, like the Shark, come with cleaning fluids. However, they get expensive if you’re using them regularly. If you’re planning to use cleaners with your mop, you’ll want to consider the maintenance price of buying cleaner while you shop. Steam mops aren’t the most rugged machines in the world. None of them are outstanding in terms of durability, but you should expect at least a few years of service out of your new mop. Look for metal wands and sturdy plastic casing. Most damage happens to cheap plastic clips, switches, and caps. Be careful with delicate parts, as they’re weak points on nearly all steam mops. Try to avoid fiddly little parts which can break, such as clips that hold cleaning cloths and little brackets. To make your mop last longer, make sure you’re following the manual. Most will tell you to use only distilled or bottled water. You might be able to get away with using tap water, if you’ve got a good filter in your home. We would still recommend following the manufacturer’s instructions, though. Distilled water is relatively inexpensive, and the only sure way to prevent mineral buildup and damage. Having a mop that works wonders and saves your back is worth spending a couple of dollars on bottled water. Before you decide which model to buy, make sure you take a moment to consider your flooring type. Depending on the materials and textures you need to clean, different models will do a better job for you. If you have flat tiles, or linoleum, you’ll be able to get away with using most good steam mops. If you have deeper grout or uneven stone tiles, we recommend a mop with pressurized steam or a spray function. Pro Tip: If you have deep grout, make sure you’re not injecting too much steam! This can leave water at the bottom of the cracks. Residual moisture can cause mold and mildew, which you’re trying to eliminate in the first place. Always remember to check the warranty on your floors! Steam mops are meant for sealed floors only, and some flooring brands warn against steaming. Make sure you check your warranty, so you know whether the manufacturer recommends this kind of cleaning. You can also see what kind of coverage you’ll have if something unexpected happens. If you don’t have a flooring warranty at all, it might be better not to risk steam mopping. Remember that you can always call your installer if you’re not sure what your situation is! Learn more about the different types of floor warranties. If you’re interested in our recommendations for the Best Steam Mop Reviews, visit our homepage! We’ve also got you covered with handy guides to the best carpet cleaners, steam cleaners, and more! You’ll find more in-depth reviews and how-to guides for all your steam cleaning needs. And due to popular demand we’ve also spent the last two months reviewing all of the top robotic window cleaners on the market (our office windows have never been cleaner!). If you’re considering purchasing an automated machine to keep your glass clean, check them out.